For most workers, employers typically provide a 401(k) Plan to which employees can defer a portion of their pay with certain tax preferences. For the self-employed, the circumstances are a bit different. However, owners of their own businesses have a bevy of options available to them for their own retirement savings. Up front, this article will provide information related to certain types of retirement accounts. The information provided is general in nature. Before acting on it, it is advisable to consult, at a minimum, your Tax Preparer (Accountant), and even better, a Financial Planner. I tell the following to all business owners: Choosing to work for yourself is undoubtedly a liberating experience – both from a time and creativity perspective. Financially, the typical entrepreneur usually must initially invest a considerable amount of her resources (time & money) in her fledgling company. Sooner or later, it is important for a business owner to realize that the business also must support its owner financially. Therefore, it is wise for a business owner to at least consider taking money out of the business – both for salary and retirement savings - as it is easy for a business to consume all available capital. Counting on an unbelievable sale of your business is a plan, yet it is one an owner might want to hedge by taking advantage of some of the strategies described below. For the remainder of this article, let’s assume that whoever the reader is – contractor, business owner, other interested person, etc. – you are either a “1099” employee or a business owner whose company is organized as either an S-Corp, LLC, or Sole Proprietorship. With this very wide net of potentials, all the strategies described below are possibilities. If you are a “W-2” Employee for a company you do not own, this article is not for you. Let’s also further assume your business is well-financed and there is distributable cash beyond what the business needs to maintain operations. I will describe some of the Retirement Account Options next. Contributions can be made up until the tax filing deadline – Meaning on or about April 15th of the following year for the previous year’s contribution. You must have earned income to contribute. You may only contribute up to your earned income – if you earn $3,000, you can only contribute $3,000. There are never any Required Minimum Distributions. A Non-Working Spouse can open a Roth IRA based on the Working Spouse’s Earnings. Roth IRAs can be passed on to Beneficiaries and maintain their Tax-Free Status. Earnings may only be withdrawn after reaching age 59 ½...there is a penalty if you do so beforehand. I'm simplifying as there are some other instances where distributions are permitted penalty-free. However, I will not go into those details here. While there may appear to be many rules governing Roth IRAs – and there are – they are not overly cumbersome. Once you open your own Roth IRA, the rules become much more tactile and you will grasp them easily. There are some other more detailed rules concerning withdrawals like the 5-Year Rule. In the interest of space, I will skip them here. Whatever the case, consult a tax professional if you are considering early withdrawals from your Roth IRA. Practically speaking, the Roth IRA is arguably the best retirement option out there for the masses. The concept of paying income taxes now and never again is appealing, especially if you are in a lower Income Tax bracket. Bottom Line: If you don’t have a Roth IRA, get one! Who should use this option: For contractors or business owners who are only looking to save no more than $5,500 and you meet all the caveats above, this is the option for you. The paperwork is very simple for these accounts, which can be opened at any reputable brokerage firm in the individual’s name. And the account need not be linked in any way to your business. On that note, you can employ a Roth IRA in concert with any of the strategies below, which will be of particular interest if you want to contribute a large amount of money to your retirement accounts. Only an eligible employer may establish a SIMPLE IRA, so your entity must have its own Employer Identification Number (EIN), which will be used in the Plan Documents. The annual maximum contribution is $12,500 for 2018 with Catch-Up Contributions of $3,000 for those over Age 50. Withdrawals are only permitted at Age 59 ½ - earlier withdrawals carry a penalty. You cannot Rollover a SIMPLE IRA to a Traditional IRA until 2 years after the SIMPLE is funded. Other IRAs cannot be “rolled in” to a SIMPLE IRA. Contributions are made Pre-Tax, meaning you get a Current Year Income Tax Benefit; however, withdrawals are taxed at Regular Income Tax levels. A SIMPLE IRA is largely similar to a 401(k) in its functionality, though it is easier to administer, i.e. less paperwork. The notable difference between a SIMPLE IRA and both a Traditional IRA ($5,500) and 401(k) ($18,500) is the contribution limit of $12,500. Of note, as a company owner, you may also contribute to Employee Accounts. Since we are focusing on Self-Employed folks here, I won’t delve those details in this article. In comparison to a Roth IRA, the Current Year Tax Deduction you receive with a SIMPLE IRA means you will pay no Income Tax on the deferral in the Current Year, though you will pay Income Tax when you ultimately withdraw the money at retirement. Who should use this option: If you have the capacity within your business to distribute up to the $12,500 limit, then a SIMPLE IRA may be for you. Also, if you have a considerable amount of taxable income now and expect to have less income in your retired years, a SIMPLE IRA may be for you as you receive a current year deduction while your income is relatively high and will withdraw funds when your earned income is low (or perhaps zero). All in all, this is a very good option for deferrals between $5,500 and $12,500. You may contribute up to 25% of your pay into a SEP. For the self-employed, this amount is determined by your Schedule-C Income (this includes Sole Proprietors). For partnerships, your K-1 determines your contribution limit. The maximum contribution you can make is $55,000. For those over 50, you can contribute another $6,000. You will need to have an EIN for your business. Contributions are discretionary, so you need not make contributions every year. You receive a current year tax deduction for your contribution – there are no Roth SEPs. The same caveats apply for withdrawals – before 59 ½ there are issues (See your Tax Advisor), after that, any withdrawals are recognized as income. There is the potential to provide accounts for employees, though since I am focusing on the self-employed here, I won't elaborate on that aspect of SEPs. Who should use this option: If you have a large amount of income and you can afford to make sizable contributions to a retirement account, then the SEP IRA is a great option. Moreover, if your income varies because of the peculiarities of your business, you need not contribute every year, which may be of interest to you. All in all, this is a great option for the Self-Employed. Also referred to as the “Solo 401(k)”, the Individual 401(k) is similar in form and structure to the employer-provided 401(k) with which we are all familiar. For these plans, your business must have its own Employer Identification Number (EIN). To establish an individual account, you have to first establish the Plan, typically with a boilerplate document provided by the brokerage firm you select as the Trustee of the plan. Then, you complete separate documents to open your individual account. Note: The Maximum Contribution calculation is based on the earnings before the 401(k) contribution. Some 401(k) Trustees will allow 401(k) loans in a similar manner to how the larger corporate 401(k) programs do. While I personally do not like the concept of borrowing against retirement funds, self-employed individuals frequently are capital-starved for high-potential opportunities within their businesses, so perhaps this option might be worthwhile to consider. As the name implies, the Solo 401(k) is intended for individuals. Therefore, if you anticipate having employees in the future, this plan might not be for you. Of note, you are permitted to establish an account for your spouse if they are gainfully employed within the business. Also, contributions to a Solo 401(k) are independent of any contributions you make to an IRA. Therefore, if your situation permits it, you can contribute $5,500 to either a Traditional or Roth IRA and potentially up to $55,000 to an Individual 401(k) – with catch-up contributions if you are over 50....this is a significant amount of money. Once plan assets exceed $250,000, you have to file Form 5500 – a relatively simple IRA form. Your plan Trustee will provide you the necessary information each year. Depending on which provider you choose as your Trustee, you can “roll in” funds from other 401(k)s and/or Traditional IRAs. If you roll-in a Traditional IRA, that could avail you of future “Back Door” Roth Contributions. The corpus of this strategy requires a lengthy discussion I will skip here, though this is an important point for those looking to contribute to a Roth IRA. The paperwork is a bit cumbersome on the front end for Solo 401(k)s, though once your plan is established, the administrative burden lessens dramatically. And since you are in an individual plan, you need not worry about any sort of Safe Harbor provisions related to Employee Account contributions…you are the only employee! Plus, Solo 401(k)s are ERISA plans, though again, since you are the only employee, the ERISA factor is mostly mitigated. Additionally, believe it or not, you can establish a Roth Solo 401(k). Of all firms, Vanguard offers such a plan. You simply complete their boilerplate documents to establish your plan and then open an account for you and perhaps your spouse. Then, you can defer $18,500 each into the account. Depending on a variety of tax-related factors, the Roth option may or may not be of interest to you. There are other Solo 401(k) providers – Fidelity and TD Ameritrade are good options – though they do not offer the Roth option as of this writing. Additionally, not all providers will permit 401(k) loans (Fidelity does not), so if this quality is of importance to you, please make sure to check early on so you do not waste your time arranging a plan that does not do what you want. Her annual pension may approach $85,000 annually. If she is also receiving VA Disability, that may tack on another $1,000 or so per month tax-free. Thus, just from her military benefits, this hypothetical retiree may earn close to $100,000 in addition to having a very low-cost medical care benefit. If you throw in an empty nest, a paid-off mortgage, and a reasonable budget, this individual may have little need for extra earnings. If this same person decides to do consulting work, we could reasonably presume she may earn an additional $100,000. Assuming she does not “need” the money for living expenses, much of these earning can go into tax-preferenced accounts, thus lowering the present-day tax burden. Or, in the case of a Roth Solo 401(k), bolster retirement accounts for later years or legacy planning. In short, the Solo 401(k) is a little-known Retirement Planning tool with a serious amount of potential to beef up retirement account balances. Plus, you can couple Roth IRA contributions with this Plan. Of all the options I have described, I like this one the best. Regardless of which of the above options you choose, once your plan is established and your account is open, ultimately, contributions will flow into your account. Once there, you will have an exceptionally wide array of choices available to you for investment, much more than the typical employer-provided 401(k) plan. Furthermore, since investment expenses are almost all trending lower, you can select investments with rock-bottom fees. A broad array of investment choices is a hallmark of each of the above plans. Just because you are self-employed does not mean you are devoid of retirement savings opportunities. Actually, you have many more options available to you than to those who work for others. Once your business is established and you are able to pursue retirement savings opportunities, you should consider the options above in your calculus. A financial planner, in concert with your accountant, can assist you with selecting the best plan for you. 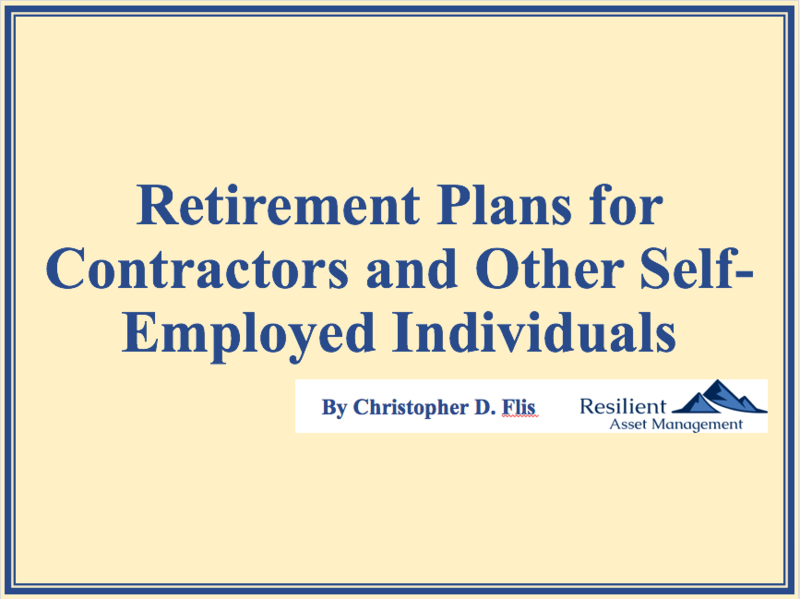 If you have any questions about any of the Retirement Strategies mentioned in this article or would like to send a comment, please feel free to contact Christopher D. Flis at Resilient Asset Management here.